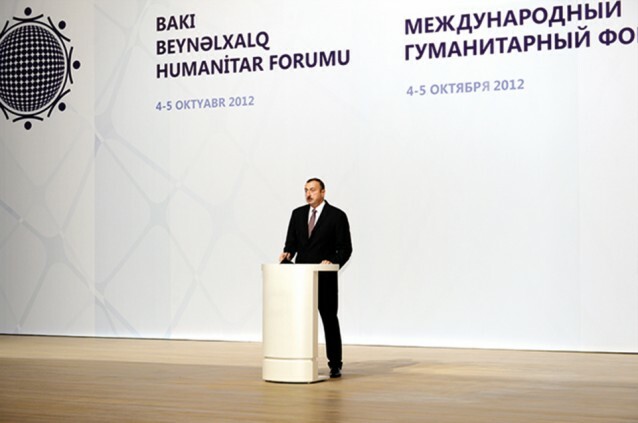 The scope of the second annual Baku International Humanitarian Forum (4-5 October) was evident from the moment I arrived in the Azerbaijani capital. Intercepted at the entrance to the customs and passport hall designed for mere mortals, myself and a couple of other arrivals on the Azerbaijan Airlines flight from Istanbul, we were spirited over to the V.I.P. lounge to join a growing horde of international participants to the event—the Humanitarian Forum, set up two years ago under the auspices of the Azerbaijani and Russian Federation presidencies. It was not my first conference in Baku. Over the years, I have unofficially represented the United States (meaning really just myself) at conferences as disparate as The Role of Women in International Dialogue, Youth and Conflict Resolution and even The New Media and Islam (if I recall correctly) among others. 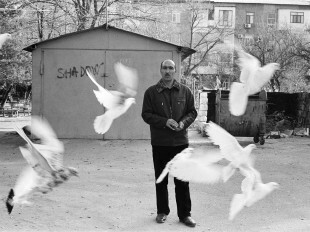 But this particular conference had the feel of being somehow bigger, better and more profound: here was Azerbaijan, the nearly failed-state of 1991, once again stepping out on the world stage, and displaying what sort of country it has become after a mere twenty years of restored independence. Thanks to some necessary organizational delays—different planes were still arriving from different destinations, but with passengers pre-booked into six five-star hotels who needed to be sorted—and needing some air, I found myself chatting with two new guests: the former German ambassador to both France and the United Kingdom (of course at different times!) who now works as a lawyer in Berlin, and a Russian-born Israeli television personality and professor of political science, who had attended the first International Humanitarian Forum last year. As a result, the Israeli now knew everything about Azerbaijan, and his conversation was marked by so much innuendo and too-clever-by-half statements of political insight that I found myself merely smiling and nodding and waiting for him to get on his bus; the former German ambassador, in sharp contrast, was eager to learn anything he could as we drove into town together. We exchanged cards when he got off the bus at his hotel; I never saw him again, but had this thought: If the Israeli was clearly in town to have a free vacation, the German was actually here to listen and learn. Along with a gaggle of other attendees, I checked in to the efficient Kempinski Badamadar hotel on the heights above the city; while I need no special services when in Baku, there was a pleasant and efficient ‘Go To Team’ of young Azerbaijanis who had set up shop in the lobby, and who greatly assisted the ‘green-horn’ guests from around the world. At that point, I started to run into old friends from Turkey, the United States (I was not the only participant from the US, but there were not too many of us, if truth be told), Italy, France, UK and elsewhere. See you are showing a film at the opening, said an old friend. The next day we boarded our buses and drove to the Heydar Aliyev Center. It was not finished the last time I was in town, and so I presumed that this was just a drive-by to show everyone this spectacular new addition to the Baku skyline, and that we would take a few pictures and then travel on to the Buta Palace on the airport road. No indeed…I am not sure if we were the first major event to be held in the HAC, but it certainly felt like it. And it was here that attending the conference from such a great distance (the western US state of Montana; it had been a 30 hour trip to only spend some four or five days in Azerbaijan) finally made sense. Milling around the coffee and tea and juice bar were dozens, scores of old friends, many of whom I had not seen in years. There were the Azerbaijani ambassadors assigned to France, Italy and Egypt, leading specific delegations from those countries; old chums in presidential security whom I had met in 1992 and 1993 let me know that President Ilham Aliyev was certain to deliver the opening key-note address (the head of presidential security even slipped me a couple of walnuts with an impish wink and grin, as they are believed to have aphrodisiacal properties). Inside the sumptuous main auditorium, President Aliyev welcomed us all and spoke solemnly about the tradition of tolerance in Azerbaijan, as well as detailing the progress that this ever-fascinating and surprising little country on the shores of the Caspian has made since restored independence—in all areas save one: the continued occupation of the western Azerbaijani region known as Karabakh. Scheduled to speak next as joint host was Russian Federation President Vladimir Putin; we were all a little disappointed that he sent a surrogate to read his welcoming remarks instead. After the opening remarks and net-working coffee break, the working sessions began. The first was hosted by Foreign Minister Elmar Mammadyarov, whom I first met back in 1991, and consisted of ten former presidents of Baltic and Balkan states, along with Kyrgyzstan (oddly, Bulgaria had three of the ten!). While all presentations were erudite and by definition lofty in terms of humanitarian aspiration, general consensus had it that the most moving was the one delivered by former president of Latvia, H.E. Mrs. Vaira Vike-Freiberga, who noted that she had become a refugee at the age of six, and had been unable to return to her native land until the collapse of the Soviet Union in 1991. She did not mention the word ‘Karabakh’ once, but everyone in the grand HAC hall knew exactly what she was talking about. Following a delicious lunch (I found myself at what might be called ‘The Romanian Table,’ Dr Mahmud Karimov, chairman of the Azerbaijani Academy of Science hosted the second plenary session, which consisted of eleven recipients of the coveted Nobel Prize in the fields of economics, physics and chemistry between the years of 1972 and 2011. How appropriate that Baku, where the Nobel brothers made their fortune, has now re-established its unique claim on this unique tribute to intellectual achievement! Of all the presentations, for me the most heartfelt was delivered by Dr Ahmed Zewail, who won his prize in Chemistry in 1999. Originally from Egypt, but now resident in California (and a member of US President Barrack Obama’s ‘Outreach Team to the Muslim World’, Dr. Zewail’s remarks were basically a plea for the Muslim World to experience a scientific renaissance—with the inference that Azerbaijan might just be the center of that effort. By this time, many guests were becoming numbed by jet-lag and the sheer tsunami of information given by so many fascinating voices on so many different themes—and the last panel of the day, hosted by Azerbaijan Minister of Culture and Tourism Dr. Abulfas Garayev, was a brief summation of the next day’s working panels by the chairmen of those panels. The themes ranged from Humanitarian Aspects of Economic Development (and the exploration of the concept of whether a higher GDP and higher levels of education lead to greater human happiness) to Traditional Systems of Values in a Post-modernist Culture and Modern Mass Media and New Challenges. After the session broke up, I approached my old friend Dr. Kamal Abdulla, rector of Baku Slavic University, and informed him that I intended to attend his working group on Multiculturalism, and he said he would find a place for me on the experts’ panel. It was not to be: the organizers of the International Humanitarian Forum had made one small slip-up: they had neglected to inform me that I was to give a key-note address at the Modern Mass Media panel the next day, and based on the paper I had presented for publication on the role of western media in the Karabakh conflict. I was rather surprised to learn this some twenty minutes before I was to speak—but after twenty years of association with Azerbaijan, I have learned to think on my feet. I missed the bus from the Kempinski Badamar by two minutes to join the other delegates at the gala reception at the Buta Palace, but so did a Pakistani publisher and his wife, so we jumped into one of the new purple taxis and shared the fare. Once again, old friends were coming out of the woodwork, and a fine networking evening was had by all—with one exception: the wife of the Pakistani publisher had brought gifts for First Lady Mehriban Aliyeva, but was apparently unable to deliver them. On the final day, all delegates were divided into their respective working groups. But given the sheer size of the conference, and the fact that it was in effect scattered all over town, one sad result was that one could not easily shift from one theme to the next. Thus, upon my discovery that I was actually a leading panelist on Modern Mass Media at the Kempinski Badamdar Convention Center, there was no reasonable way that I could attend Dr Kamal Abdulla’s panel on Multiculturalism down at the newly opened Four Seasons, much less the interesting panel on Humanitarian Aspects of Economic Development at the International Mugham Center. By six o’clock, everyone was exhausted—so I slipped off to the Icheri Sheher for a quiet glass of wine and the opportunity to call a few old friends in town. Unlike the other delegates, who had organized trips to the regions (Ganja, Quba and Nakhchivan) as an added exploration of Azerbaijan, my time was so short I opted to stay in Baku, and attend a lovely afternoon at Kamal muellim’s house in the city, in the company of a Medieval German specialist, a Dutch Turkologist (and translator of Dede Qorqud) and one of the Nobel winners, who had a special interest in the mysterious Khazars. All in all, it was a richly rewarding conference, and it felt very good to be back, even briefly, in the ever-changing Land of Fire. My friends from TEAS provided a car to the airport, and I spent all of 10 October flying some 30 hours back to Montana, where I had school the next day. Congratulations, Azerbaijan—and I look forward to a return invitation next year!